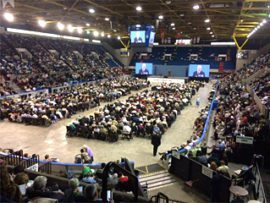 Cornwall Ontario – Cornwall will once again host two major gatherings of Jehovah’s Witnesses, marking the 21st year that the Civic Complex has hosted the group. The first of of two conventions gets underway on Friday June 15 and runs until Sunday June 17, and the second takes place from June 22 to 24. Combined attendance is expected to be 6,000, with many coming from far away. 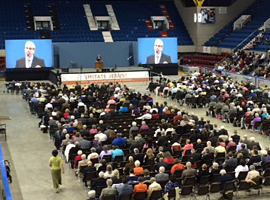 The theme of the 2018 convention is “Be Courageous”. 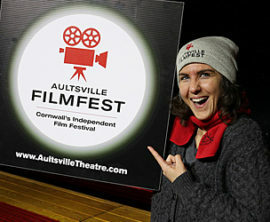 The Cornwall events are part of a much larger series of conventions held at venues in 180 lands, including 29 locations across Canada. The three-day program consists of 54 presentations that will include talks, audio dramas, interviews and short videos. A further highlight of the program is a feature film entitled “The Story of Jonah-A lesson in Courage and Mercy” which will be shown on the final day of the convention. It is a true story based on the Bible Book of Jonah. Each day the morning and afternoon sessions will be introduced by music videos prepared specifically for the convention and will help each one to get mentally prepared for the program that follows. Members of the public are invited to attend the convention. There is no admission free, and no collection will be taken. 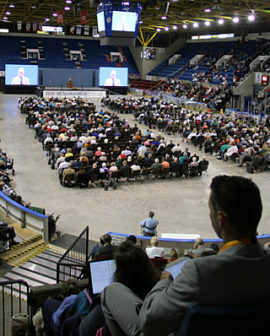 The Conventions are part of a world wide Bible educational work that is for all races, cultures, and languages. 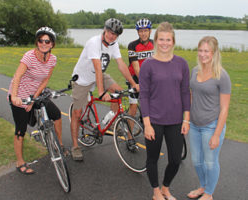 One of the benefits of the Complex as a convention site is the immediate proximity to Lamoureux Park and the Waterfront Trail. Convention attendees can lunch in the park and explore Cornwall’s downtown and scenic waterfront. The Complex provides enough parking to accommodate the convention as well as patrons of the Aquatic Centre. Situated in scenic Lamoureux Park on the banks of the St. Lawrence River, the Cornwall Civic Complex is a highly versatile and modern facility. The heart of the Civic Complex is the Ed Lumley Arena, a modern ice rink that boasts seating for up to 5,800 people. The Civic Complex has played host to a number of high-profile special events in recent years including sporting, cultural and community events.